At weekends, I hate to cook lunch. Usually Doug and I will eat whatever leftovers we have in the fridge. We need to eat the leftovers because they can really pile up! This morning I cooked rice porridge for breakfast and since I had breakfast really late, I skipped lunch and started preparing dinner at 3.30 pm. Since I had planned on cooking beef stew, I thought 3.30 p.m. was a good time to start cooking. The beef pieces were quite chunky and even though I still have all my teeth, err, almost all, I hate to eat food where I have to chew and chew and chew. My jaws get tired really easily. No kidding! 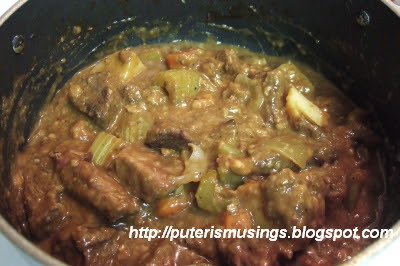 My previous beef stew did not taste quite the way I remembered beef stew is supposed to taste. This time I bought the McCormick beef stew seasoning. I think I bought other brands previously. I read the instructions on the little packet carefully, and made sure the beef chunks were properly coated with flour and properly browned on all sides before I poured in the water and the seasoning. I let the whole thing simmer for an hour before I added the vegetables, as per the instructions on the packet! I guessed that did the trick because the beef stew was quite tasty. Thick and flavorful, and far better than my previous attempts!